During the Iron Age half burnt chicken boneshave been found in Denmark and by the size of it clearly shows that it comes from domestic fowl. 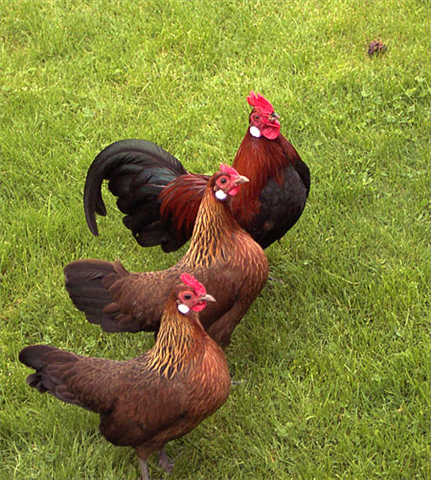 This was the first sign of domestic fowl in Denmark. From that time onwards many foreign breed chickens arrived in Denmark but from the 1800s there are countless evidence of the existence of a special Danish chicken type. The Danish are more than 2000 years old. But where does it come from? The story begins 5000 to 8000 years ago in northern India and Southeast Asian region, where at least 4 species of wild jungle fowl have lived for countless millenia and continue to live as wild birds. It is believed that all the domestic fowl descended from one or more of these wild fowl species, although the details of the origin is quite obscure and will hardly ever be fully clarified. Today it is believed that the red jungle fowl plays a very important role as the progenitor of the Danish Country Chicken. The Danish has been brought to Denmark by the immigration of Germanic tribes from the east, arriving probably around 400 years BC who migrated into the Northern Europe area which includes Northern Germany, Denmark and the rest of the Scandinavian area. Until the early 1800’s the Danish were known basically as country chickens in Denmark. In 1879 the “Association for poultry-promotion” called members to refrain from outcrossing breeds, and they laid down the detailed characteristics of the breed. The first standard was published in 1901. Danish chickens have a slightly condensed not too slender body, with plump mature rear of the hen. It is hardy and resistant to diseases. They diligently seeking food and has a relatively low feed consumption, are excellent layers and the chicks are fairly hardy and fast growing.